Don’t Gamble Away Your Vacation! Hit the Jackpot and choose Ocean’s Eleven for a fun-filled week with amenities galore! Gather the whole gang where the- Living is Easy - at Ocean’s Eleven, a luxurious hideaway, situated in the popular Ocean Sands community. Enjoy gorgeous panoramic views from the living room and kitchen/dining areas, making the perfect backdrop for a vacation you’ll want to repeat year after year. 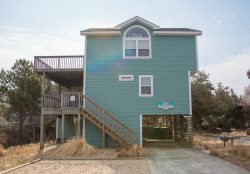 Spend the day soaking up the sun on beautiful beaches of Corolla, right in your own backyard! Take a swim in the 10X22-ft private pool or soak some stress away in the hot tub. Play some corn-hole and enjoy that new gas grill for some gourmet outdoor grilling. If you are ready for some action, challenge the gang to some pool in the recreation room fully equipped with a wet bar and extra refrigerator. Cook up some local catch in the spacious gourmet kitchen with stainless appliances, large dining area, and breakfast bar. Ocean Sands community privileges are yours for the taking; including community L-shaped pool with an additional kiddie pool and tennis courts. In addition, the Corolla bike path passes Ocean Sands, making it an easy ride to 2 nearby shopping centers that offer grocery stores, restaurants, coffee shops, boutiques, and entertainment. No matter what your interests are, Ocean’s Eleven has something for everyone. Come relax, enjoy and celebrate with family and friends. Cars than spaces they will need to identify alternate parking outside Ocean Sands. There is no parking in the street due to the need to have room for emergency vehicles to access the homes. Mid-Level: 2 King Master Bedroom, 1 Bedroom with 2 Bunk Sets and 1 Bedroom with duo-bunk bed and twin size trundle and Shared Hall Bathroom, Sitting Area and Landing.